Hajirahimi, Z., Khashei, M. (2016). Improving the performance of financial forecasting using different combination architectures of ARIMA and ANN models. Journal of Industrial Engineering and Management Studies, 3(2), 17-32. Z. Hajirahimi; M. Khashei. "Improving the performance of financial forecasting using different combination architectures of ARIMA and ANN models". 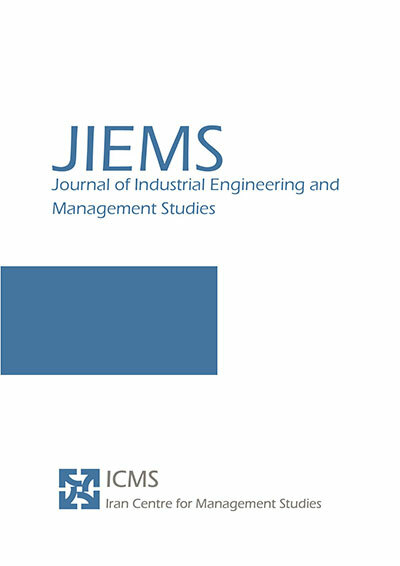 Journal of Industrial Engineering and Management Studies, 3, 2, 2016, 17-32. Hajirahimi, Z., Khashei, M. (2016). 'Improving the performance of financial forecasting using different combination architectures of ARIMA and ANN models', Journal of Industrial Engineering and Management Studies, 3(2), pp. 17-32. Hajirahimi, Z., Khashei, M. Improving the performance of financial forecasting using different combination architectures of ARIMA and ANN models. Journal of Industrial Engineering and Management Studies, 2016; 3(2): 17-32. Department of Industrial and systems Engineering, Isfahan University of Technology, Isfahan, Iran. Despite several individual forecasting models that have been proposed in the literature, accurate forecasting is yet one of the major challenging problems facing decision makers in various fields, especially financial markets. This is the main reason that numerous researchers have been devoted to develop strategies to improve forecasting accuracy. One of the most well established and widely used solutions is hybrid methodologies that combine linear statistical and nonlinear intelligent models. The main idea of these methods is based on this fact that real time series often contain complex patterns. So single models are inadequate to model and process all kinds of existing relationships in the data, comprehensively. In this paper, the auto regressive integrated moving average (ARIMA) and artificial neural networks (ANNs), which respectively are the most important linear statistical and nonlinear intelligent models, are selected to construct a set of hybrid models. In this way, three combination architectures of the ARIMA and ANN models are presented in order to lift their limitations and improve forecasting accuracy in financial markets. Empirical results of forecasting the benchmark data sets including the opening of the Dow Jones Industrial Average Index (DJIAI), closing of the Shenzhen Integrated Index (SZII) and closing of standard and poor’s (S&P 500) indicates that hybrid models can generate superior results in comparison with both ARIMA and ANN models in forecasting stock prices. Aladag, C., Egrioglu, E and Kadilar,C., 2009“ Forecasting nonlinear time series with a hybrid methodology”, Applied Mathematics Lettres, Vol.22, PP.1467-1470. Areekul, P., Senjyu, T., Toyama, H and Yona, A.,2010, “Notice of violation of IEEE publication principles a hybrid ARIMA and neural network model for short-term price forecasting in deregulated market”, IEEE Transactions on Power Systems, Vol.25 ,PP.524-530. Babu, C.Narendra.,Reddy, B.Eswara.,2012 “A moving- average filter based hybrid ARIMA-ANN model for forecasting time series data”, Applied Soft Computing, Vol.27, PP.27-38. Bates, J.M., Granger, C.W.J., 1969, “The combination of forecasts”, Journal of the Operational Research Society, Vol.20, No.4, PP.46-451. Box ,P., Jenkins, G.M.,1976, Time Series Analysis: Forecasting and Control, Holden-day Inc., San Francisco, CA. Chen,K., Wang, C., 2007,“A hybrid SARIMA and Support vector machines in forecasting the production values of the machinery in industry in Taiwan”, Expert System with Applications, Vol.32,No.2, PP.254-264. Gairaa, K.,Khallaf,A.,Messlem,Y and Chellali.,F.,2016 “Estimation of the daily global solar radiation based on Box–Jenkins and ANN models: A combined approach”, Renewable and Sustainable Energy Reviews, Vol.57, PP.238-248. Katris, CH., Daskalaki, S., 2015, “Comparing forecasting approaches for Internet traffic”, Expert Systems with Applications, No. 42, PP. 8172–8183. Khashei, M. Bijari, M.,2012, “Hybridization of the probabilistic neural networks with feed-forward neural networks for forecastin”, Computers &Industrial Engineering, PP.1277-1288. Khashei, M., Bijari, M., 2011 “A novel hybridization of artificial neural networks and ARIMA models for time series forecasting”, Applied Soft Computing, Vol.11, PP.2664–2675. Khashei, M., Bijari, M.,2010, “An artificial neural network (p, d ,q) model for timeseries forecasting”, Expert Systems with Applications,Vol. 37, PP.479–489. Khashei, M., Hejazi, S.R and Bijari, M.,2008, “A new hybrid artificial neural networks and fuzzy regression model for time series forecasting”, Fuzzy Sets and Systems, Vol.159, No.7, PP.769-786. Kristjanpoller, W., M.C. Minutolo.,2015, “Gold price volatility: A forecasting approach using the Artificial Neural Network–GARCH model”, Expert Systems with Applications,Vol.42, No.20, PP.7245-7251. Kumar, M., Thenmozhi, M.,2014, “Forecasting stock index returns using ARIMA-SVM, ARIMA-ANN, and ARIMA-random forest hybrid models”, International Journal of Banking, Accounting and Finance, Vol.5, No.3, PP.284-300. Moeeni, H., Bonakdari, H., 2016, “Forecasting monthly inflow with extreme seasonal variation using the hybrid SARIMA-ANN model”, Stoch Environ Res Risk Assess. Pai, P-F., W-C, Hong. 2005, “Support vector machines with simulated annealing algorithms in electricity load forecasting”, EnergyConversion and Management, Vol.46, No.17, PP.2669-2688. Pham, H.T., Yang, B.-S., 2010 “Estimation and forecasting of machine health condition using ARMA/GARCH model”, Mechanical Systems and Signal Processing, Vol.24, No.2, PP.546-558. Reid, D.J., 1968, combining three estimates of gross domestic product, Economica, PP.431-444. Shafie-khah, M., Moghaddam, M. P. and Sheikh-El-Eslami, M. K.,2011, “Price forecasting of day-ahead electricity markets using a hybrid forecast method”, Energy Conversion and Management,Vol.52, PP.2165-2169. Wang, J.-J., Wang,J-Z., Zhang,Z-G and Guo, SH-P., 2012, “Stock index forecasting based on a hybrid model”, Omega, Vol.40, No.6, PP.766-758. Wongsathan, R., Seedadan, I., 2016, “A hybrid ARIMA and Neural Networks model for PM-10 pollution estimation: The case of Chiang Mai city moat area”,Procedia Computer Science, No, PP. 86 273 – 276. Xiong,T., Li,Ch and Bao., Y., 2017, “Interval-valuedtimeseriesforecastingusinganovelhybrid HoltI and MSVR model”, Economic Modelling, Vol. 60, PP. 11–23. Yuan, X., Tan, Q., Lei, X., Yuan, Y., and Wu , X.,2017, “Wind power prediction using hybrid autoregressive fractionally integrated moving average and least square support vector machine”, Energy, NO.129, PP. 122-137. Zeng, D., Xu, J., Gu, J., Liu, L and Xu, G., 2008, “Short term traffic flow prediction using hybrid ARIMA and ANN models”, in Power Electronicsand Intelligent Transportation System, , PP.621-625.